A schematic of the AIE-486H Heavy Machine Gun in Halo 3. 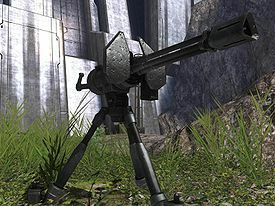 The AIE-486H Heavy Machine Gun is a standard gatling-style heavy machine gun, used by the UNSC for offensive and defensive purposes. It is also more powerful than the UNSC's stationary turret, the M247 GP Machine Gun. For defensive purposes, it can be mounted on a tripod, but when used for an assault it can be irreversibly and quickly detached from its tripod. In its unmounted form, the weapon has a limited ammunition capacity of 200 rounds and takes about a second to "spin up" before reaching its highest rate of fire. Pulling the trigger once will cause the gun to fire a maximum of two rounds at a moderate rate; holding it down builds up the rate of fire to a higher rate. The gun slowly climbs during automatic fire like the M7 Caseless Sub Machine Gun, but its recoil is lessened by the gun's weight, which makes it hard to move around as well as decreasing the user's speed. Unlike most heavy machine guns in other games (and those in later Halo titles), the AIE-486H does not overheat with continuous fire. This is a more realistic feature as having three barrels on the gun disperses the heat equally within each barrel and allows each one time to cool while the others fire, allowing the gun to remain cool and continue functioning. The AIE-486 fires 7.62×51mm Saboted Light Armor Penetrator rounds at a high rate of fire. The SLAP design incorporates a polymer sabot, which allows for the use of a tungsten penetrator projectile of a lesser diameter than the original bore. By using the casing of a large cartridge with a lightweight projectile, the velocity of the projectile is greatly increased. The bullets are powerful enough to punch through the armor of a Type-32 Ghost or a Type-26 Wraith and destroy it with ease despite their relatively small size. Although it is called a heavy machine gun, the 7.62×51mm NATO round it uses would actually classify the AIE-486H as a medium or general purpose machine gun. Like the M41 LAAG, the AIE-486H bears a striking resemblance to the GAU-19/A machine gun used by the United States military. The GAU-19 and AIE-486H both share the same distinctive flash suppressor and three-barrel build. Unlike the GAU-19, which fires .50 BMG (12.7×99mm) rounds, the AIE-486H fires the 7.62×51mm Saboted Light Armor Penetrator rounds. During Forge matches, the mounted AIE-486H can be picked up, moved, and rotated, even while another player is using the turret. If the other player rips the turret from the base while this is happening, the player will duplicate the turret. This can be used to arm an entire team with turrets. These traits also apply to Type-52 plasma cannons, and anyone seated in the turret position of a vehicle won't be forced out like the driver will. The AIE-486H is usable in Halo 3: ODST in its detached state, just as it is in Halo 3. This is done for gameplay reasons only, as an un-enhanced human should not be strong enough to pick the turret up easily, much less carry it around, fire it accurately on the move or be faster than a Spartan wielding one. The NMPD Officers in Halo 3: ODST call it a .50 cal even though it uses the 7.62×51 NATO round. In Halo 3 there is a faster way of walking with the turret than the normal speed without constantly dropping and picking up the turret, it is done by moving the left stick approximately at a 45 degree angle from the camera position; which make the player move straight and right at the same time in an angle of 45 degree but faster than walking directly straight. The player can move at the point where he wants by balancing the 45 degree of the movement by moving the camera at a point where the 45 degree angle move him straight to the place where he wants to go. It is suggestible the player use this technique when the area is free of enemies and move the turret into a normal position before the firefight starts so the player won´t be exposed and could attack quickly. HUD of the mounted AIE-486H in Halo 3. HUD of the detached AIE-486H. An angled view of a detached AIE-486H HMG. An in-game profile view of the AIE-486H HMG in Halo 3. A render of a Mark VI-clad Spartan-II holding an AIE-486. An AIE-486H HMG turret unmanned in Crow's Nest. John-117 using the AIE-486 on his way to the crashed Flood-controlled CCS-class Battlecruiser in Voi. A Mark IV-clad Spartan-II wielding an AIE-468H HMG in Halo Wars. A Trio of Spartans with AIE-468Hs. An ODST wielding a dismounted turret, alongside his squadmates in Halo 3: ODST. Joshua-029 destroys a T-26A Banshee with an AIE-486H in Halo: Fall of Reach - Invasion. UNSC Marines manning an AIE-486H in Halo Wars 2.